Childhood sweethearts Donna and Chris thought that getting pregnant would be easy. 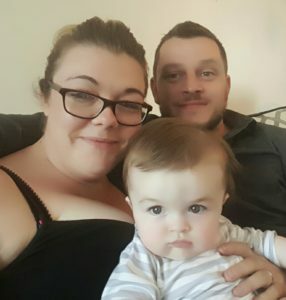 It was only after trying for a baby for 10 years and losing four pregnancies that Donna was given advice that helped her to have a baby. When Donna was 21 the couple were pleasantly surprised when they found out that she was unexpectedly pregnant. “I was nervous but happy; we hadn’t been trying for a baby at that point,” she reveals. “Then at six and a half weeks I miscarried and I surprised myself at how upset I was. “Over the next five years Donna got pregnant three more times – and each time miscarried around the same stage of six and a half weeks. She was referred to hospital and the consultant urged her to make some serious lifestyle changes. Within a week Donna successfully quit smoking and over the course of the next year she lost two stone in weight. When she went back to her GP the results of her lifestyle changes were evident: “Ideally I should have got my BMI down to 30 but it was 31 and the GP could see how much effort I had put in so he referred me back to hospital. It was then that Donna was diagnosed with Polycystic Ovary Syndrome (PCOS), a common condition that can cause weight gain, impact fertility and increase the risk of miscarriage. 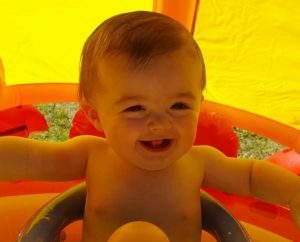 Donna was referred for IVF treatment at Bourn Hall and in December 2015 Ronnie was born. As part of National Fertility Awareness Week’s #HiddenFaces campaign Donna told her story to BBC Radio Cambridgeshire. Presenter Sue Dougan has had first-hand experience of how emotional and difficult it is to cope with infertility. They were joined by Dr Thomas Mathews, Bourn Hall’s UK medical director, who emphasised the importance of seeking good advice early on and getting ‘fertility fit’ to increase the chances of getting pregnant, such as losing weight and quitting smoking. Dr Thomas Mathews says: “There are many reasons for infertility and there is still much we don’t know, but getting you and your partner fertility fit is really important. 80% of couples will become pregnant within one year so if you have been trying for longer than this then you should seek advice. “We are so lucky the treatment worked first time. Find out more about your fertility with a Fertility Health + Wellbeing Test – click here to see more details.